The Consortium meets regularly and attracts thousands of​ attendees, including community and business leaders, elected officials, planners, economists, developers, architects, engineers, contractors, academics, and more. Information regarding the most recent event, which was held in conjunction with a complementary event in January of 2018, follows. Wasatch Choice 2050 (WC2050) is a vision for our region’s future that supports a well-functioning economy, improves air quality, and enhances Utahns’ overall quality of life. WC2050 coordinates transportation investments with land use and economic development opportunities through a collaborative approach with cities, counties, community organizations, transportation partners, businesses, and the public. Mayor’s Metro Solutions is a collaborative forum created to address the growth challenges of the greater Salt Lake Valley as the metro area becomes increasingly urban. The combined WC2050 and Mayor’s Metro Solutions event brings together stakeholders from across the region to discuss how to increase access to jobs and educational opportunities through the development of the WC2050 Preferred Scenario. Bruce J. Katz and Jeremy Nowak, co-authors of The New Localism: How Cities Can Thrive in the Age of Populism, will be the keynote speakers. 400 copies of the book will be available at the event for free (first come, first served)! Please join us. Registration is now open. Professional learning credits will also be available. For additional information regarding the event, please contact Katie Gerard. Beginning with the Envision Utah effort that led to the Quality Growth Strategy in 1999, residents from across the region explored a variety of potential futures, resulting in the Wasatch Choice for 2040 Vision. 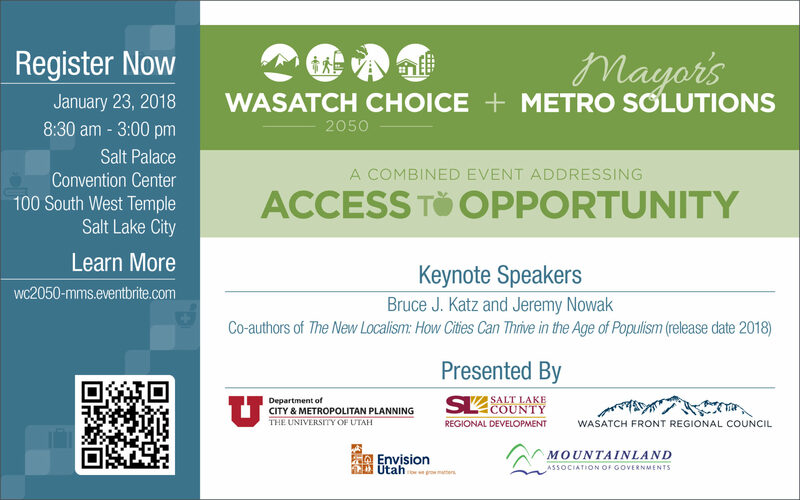 Wasatch Choice 2050, the most significant update, builds on community values through an extensive public input process and better articulates how to make the vision a reality through recommended implementation strategies.